Situated where the Morice River joins the Bulkley River, Houston offers some of the finest steelhead and fly-fishing in the province. Forestry has beenthe main industry here since the building of the Grand Truck Pacific Railway. Houston is located 30 km (19 miles) from Topley on Highway 16. After leaving Houston you will cross the Bulkley River and head north. Meaning "where the rivers meet" in the Wet'Suwet'en native tongue, Telkwa was established in the 1860's with the proposal of a telegraph line through the region. It remained the economic centre for the Bulkley Valley region until 1913 when the railway diverted. Today this village offers visitors excellent fishing opportunities for salmon, steelhead and rainbow trout as well as good canoeing and kayaking in the nearby Bulkley River. The St. Stephen's Anglican Church, erected in 1910 is located just off of Highway 16. The Telkwa Museum, in a 1920's heritage building offers interesting displays and maps of the area. This park offers good camping, nature walks and a marsh view platform for bird watching. It is located north on the Telkwa High Road. Continuing along this road, you will meet Highway 16 at Moricetown which is north of Smithers. Visit canyon walls and creek beds with fossils dating from 40 to 70 million years. 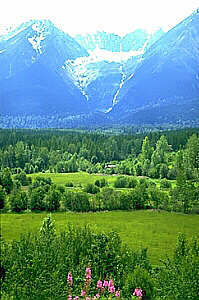 The exit to Driftwood Canyon Provincial Park is located 9 km (5.5 miles) past Telkwa. Further along is the Babine Mountains Provincial Park with excellent hiking and skiing. Located in the centre of the Bulkley Valley at the foot of the Hudson Bay Mountain, Smithers offers excellent downhill and cross-country skiing, fishing and paddling opportunities. Before the construction of the Grand Trunk Pacific Railway this area was a hunting ground of the Carrier Peoples. It became the railway's divisional headquarters. Nowadays the town's main economic stays include forestry, tourism, agriculture and some mining. Located at just east of Highway 16 at 1425 Main Street is this municipal heritage building, erected in 1925. It houses the Smithers Art Gallery, and the Bulkley Valley Museum with some 5,000 artifacts. Hudson Bay Mountain offers nordic trails and 18 down hill ski runs. Visit the Twin Falls as they tumble down the canyon walls. From here hike to the Lake Kathlyn Glacier. Access is via the Kathlyn Lake Road, west of Hwy 16 (north of Smithers).